Salad season is officially here! Thanks to the recent warm weather, we’re turning our attention to lighter, fresher meals that are a breeze to put together, but pack in plenty of nutrients and flavour. This salad pairs salty feta with juicy sweet nectarines, and adds in layers of flavour and texture with herbs, toasted seeds and a great dressing. Perfect as a quick meal in its own right, but also makes a wonderful accompaniment to a BBQ or meat-based meal. 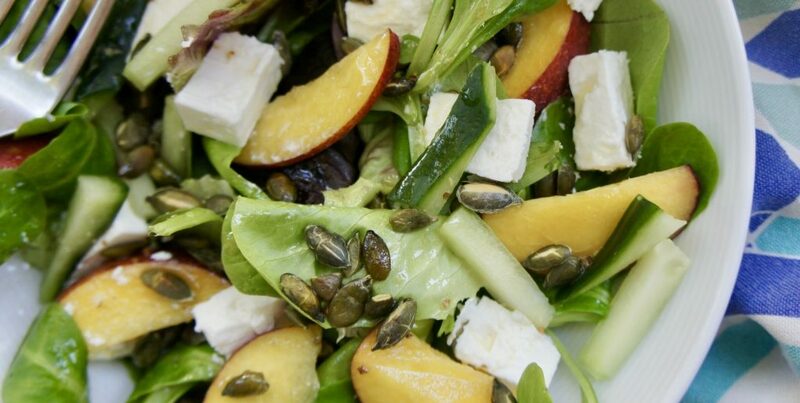 Place the salad leaves in a large bowl, and on the top, arrange the nectarine slices and feta cubes. Sprinkle over the herbs and seeds. Blend all the ingredients of your dressing together, ideally using a stick blender, but any blender will do. Finally, drizzle the dressing over the salad and enjoy.